When visiting in Morocco, the rule of thumb is to watch what others do, and follow suit. For instance, in some households, one removes shoes and leaves them at the entrance to the living room in order to not step on the carpets. In other households, one leaves shoes on; a visitor must simply observe. 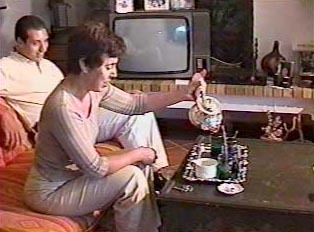 It is always a fine idea to bring a small gift when invited for tea, drinks, or dinner, but do not assume that the family partakes of alcoholic beverages. Flowers or sweets are a much safer choice than a bottle of wine. When one is dining with a family, it would be considered rude to ask for a knife and a fork if there is no silverware on the table. Much of Moroccan food is scooped up on various kinds of bread, and in a dining situation where there is no silverware, one would simply partake of the food in the manner of the host and hostess.